Is there a better alternative to FoxVPN? Is FoxVPN really the best app in Security category? Will FoxVPN work good on macOS 10.13.4? 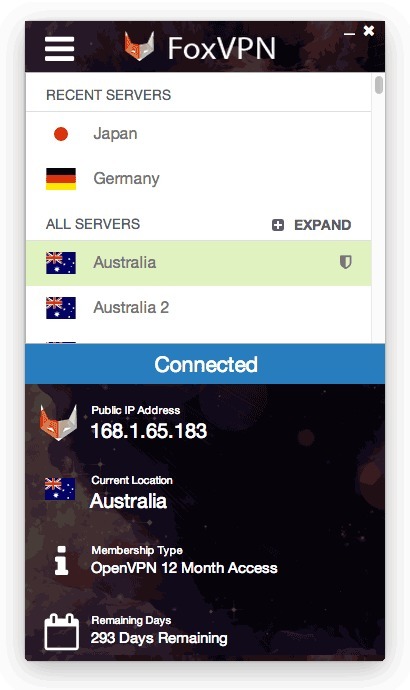 FoxVPN delivers the best VPN speeds, where your connections are secured and anonymous. Use this handy and easy-to-use app to connect to one of our servers in over 41 countries. With our secure internet solutions, we allow you to view what you want, download anything, access file-sharing, and get around those annoying limitations based on where you're located--all this while blocking out those who track you and steal your private information including governments, ISPs, hackers, and more. With our secure VPN services, you’ll always be anonymous with zero logging. FoxVPN needs a review. Be the first to review this app and get the discussion started! FoxVPN needs a rating. Be the first to rate this app and get the discussion started! FoxVPN is free to download, but the VPN service is subscription-based, starting as low as $6.95 per month.